Are you a new Ordeal member working towards your Brotherhood? Jumpstart is a resource developed by the Order of the Arrow to help new members expand their understanding of the OA. Jumpstart also includes a step-by-step walkthrough of all of the Brotherhood requirements. You will need your handbook and Adobe's Flash player to access the Jumpstart resource. 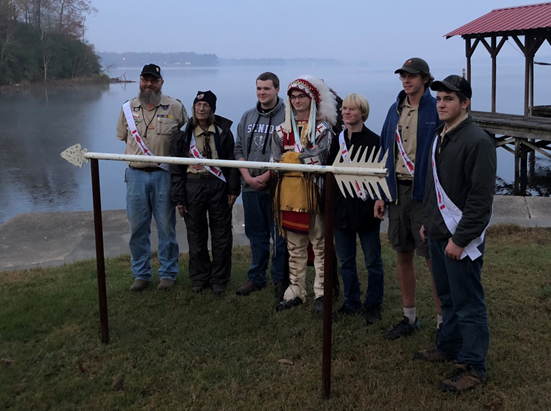 The mission of the Tejas Lodge, Order of the Arrow is to fulfill its purpose as an integral part of the East Texas Area Council, Boy Scouts of America through positive youth leadership under the guidance of selected capable adults. 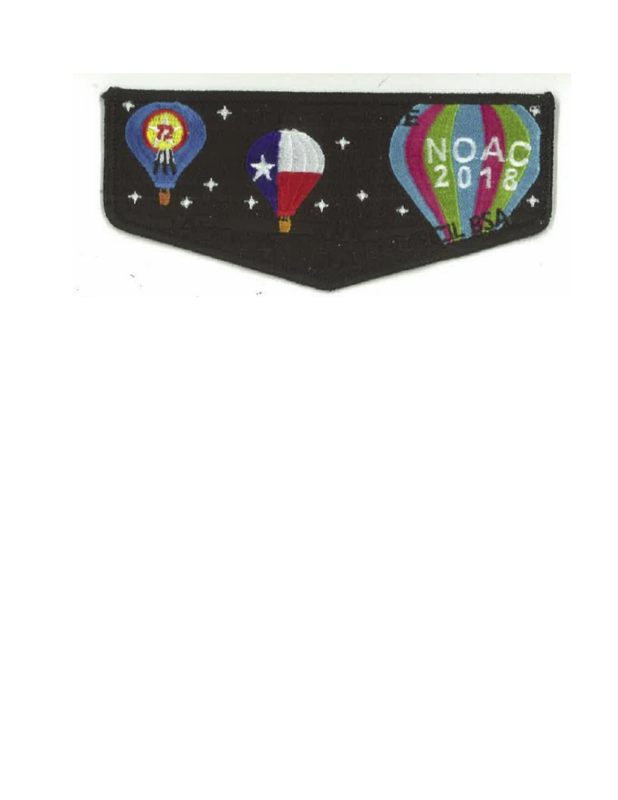 The proceeds from the patch will be used to help the youth with travel expenses to NOAC 2018. This year NOAC will be held at Indiana University in Bloomington, Indiana. The 2017 Vigil class for Tejas Lodge is Jeff Berquist, Nolan B., Joshua D., Barbara Krizan, James M., Barbara Krizan, Chris Norwood, and Hunter S. These members completed their Vigil at G.W. Pirtle Scout Reservation on December 2, 2017. Jeff Berquist received the vigil name, Ahknnitunaye Asuu which means “Bearded one who sings”. Nolan B. will be known in the vigil honor as the “chief who plays games” or Sakima Wlinhake”. Kanshawen Wisawsu is the vigil name presented to Joshua D and it means “Ambitious Blonde One”. Barbara Krizan will hence forth be known as Chipetun Nitatun or the “Courageous Skillful One”. “Memory Master” or Meshatam Temiket was the name presented to James M. Scott Norwood’s will complete his vigil in January. The final member of the Vigil class of 2017 is Hunter S., our “Unselfish Hard Working Friend” or Nepe Welalukeokan Winkalit. Congratulations to these lodge members on receiving this honor. Congratulations to the members of the Wo-Ha-Li Chapter led by Chief James M. who earned the 2017 Tejas Lodge Chapter of the Year recognition. The runner up chapter was the Five Rivers Chapter. The 2017 Lodge banquet was hosted by the Wo-Ha-Li Chapter on November 11th at Pollard United Methodist Church in Tyler, Texas. Members had the opportunity to meet and hear a keynote address from a former Tejas Lodge Chief, Matt Hill. Mr. Hill is currently the Deputy Scout Executive at the Heart of America Council in Kansas City, Missouri. Wo-Ha-Li chapter advisor Terry Westmoreland was recognized with the James E. West Fellowship Award by the members of Tejas Lodge. The 2017 Lodge and Chapter officers were recognized for their service. The new 2018 lodge officers were inducted by Associate Section Advisor Bob Berry. Congratulations to the 2018 lodge officers: Chief Lake B., Vice Chief of Administration James M., Vice Chief of Service Nolan B., Vice Chief of Ceremonies Zachary B., Vice Chief of Native American Affairs Randon B., and Secretary Ben K. The 2017 Founder’s Award was presented to Levi M. and Kevin B. The evening concluded with the 2017 Vigil Call Out. The 2017 Vigil class is Jeff Berquist, Nolan B., Joshua D., Barbara Krizan, James M., Barbara Krizan, Chris Norwood, and Hunter S.
The National Order of the Arrow Conference (NOAC) is the premier event of the Order of the Arrow and is Scouting’s second-largest national event. In 2018, several thousand Arrowmen from across our nation will gather at Indiana University in Bloomington, Indiana. The conference will run from July 30, 2018 to August 4, 2018. The conference base cost is $525. It is estimated that the contingent members will require another $400 to $650 for transportation, supplies and shirts and patches, but the cost will depend on the makeup of the contingent and our travel method. The contingent will probably travel from July 28 to August 5. Tejas Lodge has been allotted 14 youth spaces and 4 adult spaces. Tejas Lodge sent about 40 members to the last NOAC. Due to the low allotment, all arrowmen who want to go, will not be able to attend with the contingent, as a result your lodge leadership has implemented an application process. Tejas Lodge will accept applications between September 1, 2017 and September 22, 2017. Once the application period is closed the lodge leadership will select a cross section of youth and adults to represent the lodge at NOAC. The application form may be found under the resources tab on the lodge web page. Members of Tejas Lodge participated in the SR2 Section Conclave at Kinsey Scout Reservation in Stonewall Louisiana on April 21, 22, and 23, 2017. Fifty seven members from the lodge attended representing all chapters. Members competed in a variety of events from Ultimate Frisbee to Fancy Dance. All the effort came up a bit short in the Best of Section competition, resulting in a second place finish. Six Dancers represented the lodge with awards going to Justin K for a first place in Traditional Dance, Clint K with a second place in Fancy Dance and Josh M with a third place in Fancy Dance. The lodge received a first place award in the Newsletter competition and second place in the Website competition. Tejas Lodge members James M, Jonathan G, Ben K and Michael P. received first place in the Section PreOrdeal Competition. Members James M., Matt A., Jonathan B., and Michael P. earned a second place finish in the Brotherhood ceremony competition. Team mebers Caden K., Jonathan G., Timmy V., and Zachary B. placed first in the Ordeal Team completion and was recognized as an Honor Team and were presented with Belt Buckles. Jonathan G. competed in the individual Metue Legend Competition and was recognized with an Honor team belt buckle. James M received a medal in recognition of being the BEST OVERALL ALLOWAT. Michel P. was recoginized as the BEST OVERALL KICHKINET with a medal. The weekend wrapped up with a team second place victory in Ultimate Frisbee after 37 minutes of sudden death competition and a third place in Volleyball. The section also presented 4 Section Service Awards. The award is a limited edition belt buckle. Three of the 4 buckles were awarded to members of Tejas Lodge. Jonathan B., Kevin Boatman and Drate Berry received the award for the years of dedication they have given the section. All three have had active leadership roles in planning conclaves for the last several years. If you see any of these arrowmen, please congratulate them. Finally, Levi M. completed his year of service to the section. Sunday concluded his term as Section Secretary. Tejas lodge had 3 Conclave Vice Chiefs: Thomas G., Kevin B. and Jonathan B. Three adults from Tejas lodge also served as Conclave Vice Chief Advisers. They are Cece Allen, Kevin Boatman, and Chris Peuifoy. Our lodge is also represented by Bob Berry as a Section Associate Adviser. Please thank these individuals for the tireless service they provided to make this a great, fun event for all. What is a Section Conclave? It is a massive gathering of Arrowmen from 10 lodges across north Texas, from Lubbock to Texarkana, and Shreveport, LA. This year, the theme for Conclave is “SERVE,” which focuses our organization on selfless service. Caddo Lodge will be hosting this fantastic event at Garland Scout Camp in Stonewall, Louisiana. The program is packed with activities, games and shows. Have fun with hands on learning with Native American arts and crafts in the Indian Village, or challenge the talent of your chapter and lodge, get a team together for Lodgeball and other games! Are you looking for NOAC-quality training? Conclave offers some of the best training around – from activity-oriented sessions to OA Leadership Training – you just can’t beat it! Learn how other lodges operate and pick up ideas that you can bring back to your unit, chapter and lodge. Then, party the night away with a Native American Pow Wow and the Hootenanny!! A Fantastic time! The Tejas Lodge announces its Annual Lodge Banquet for November 19, 2016 at the First United Methodist Church of Henderson at 6 PM. This is the final lodge event of the year dedicated to celebrating the work of our members over the last year. This year the banquet is hosted by the Five Rivers Chapter. Accomplishments from the past year will be highlighted including the recognition of the 2016 Vigil class, the 2016 James West Award recipients and the 2016 Founders’ Award recipients. The Chapter of the Year award will also be presented to the most outstanding chapter for 2016. The 2017 Lodge Chief and his officers will be installed. Please make plans to attend this night of fellowship and celebration. Registration forms can be found under the resource tab. Registrations must be in the council office by November 11th. Patches 101 – This session is all about patches! In this training you will have the opportunity to learn about the history of Tejas Lodge’s patches, how to patch trade, and how to design your own patch (no artistic style needed). You will even have the chance to help in creating a future Tejas Lodge flap. 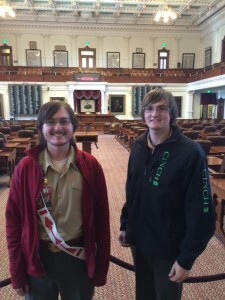 The OA Troop Rep. – Did you know that the OA Troop Representative position is one of the most important jobs in the OA? Did you also know that it’s not just a position to help you get Eagle, but a program to help others stay active in the OA? Both youth and adult are invited to attend this session to not only help your Troop in having a great OA Troop Rep., but to have a greater understanding of this (sometimes mysterious) position. You don’t even need to be a Troop Rep. to participate. Communicating in the 21st Century – Communication is key, as I am sure every scout has heard before. But why is it so important in the OA? In this session, you will have the opportunity to learn about the different forms of communication that the OA uses. In addition, you will help in getting the lodge started on different forms of social media. From email to Instagram to Yik Yak, you have the chance to get the Lodge going on the internet. Native American – Ceremonies, Dancing, and Drumming. These are the three Native American activities that you can learn from when attending the Fall Fellowship. We have nationally awarded Arrowmen teaching these classes, and they are eagerly waiting to teach the next generation of ceremonialists, dancers, and drummers. In addition to that, you are able to take home a craft from each of these areas. You do not want to miss out on these special activities. Games and Competitions – Time to get those game faces on! Gather up those team mates and get ready to compete in the Fall Fellowship games. You can play casually or gather up a team and play to win. From inflatable pony races to water ballon slingshots, we have some of the craziest and funnest games out here. and print off the registration form and mail it to the council office along with your payment. The cost for the event is $20, but will go up to $30 on September 19th. I can’t wait to see you there. Congratulations to members of the Tejas Lodge for winning “Best of Section” at the 2016 Conclave at Trevor Rees Jones Scout Camp in Athens Texas. This was a repeat win for the lodge. The “Best of Section” is awarded to the lodge at the conclave that earns the most points from the conclave competitions in ceremonies, dancing, newsletter, athletic competitions, website and other events. Tejas Dancers placed in 4 events. Justin K. took first in Northern Traditional and Jacob K. placed 2nd. In the Straight Dance competition, Jacob H. came in third and in the crowd favorite Fancy dance competition, Clint K.
The lodge had four ceremony teams competing at conclave. Chipper A., Jonathan B., Matthew M. and Mason S. placed first and received Honor Team recognition for the preordeal ceremony. James M., Bailey G., Peyton A. and Michael P. placed second in preordeal. For the brotherhood ceremony, James M., Mason S., Peyton A. and Michael P. placed 2nd. The conclave featured an ordeal ceremony competition this year for the first time in many years. The ordeal ceremony team consisted of Caden K., Jonathan G., Timmy V. and Zachary G.
The lodge topped off the competitions with wins for best website and best newsletter, culminating in the presentation of the Best of Section trophy for the second year in a row. Thomas G. completed his year as section secretary of SR2/3N at the conclave. Tejas Lodge Vice-Chief of Administration Levi M. ran and was elected Section Secretary for the newly designated SR2 section for 2016-17. Lodge advisers Chris Peurifoy and Matt Lindsey were also presented with a limited edition section belt buckle in recognition of their years of service to the section. A special thanks also goes out to our Taste Buds cook team led by Paul Vaughn who spent the weekend at conclave cooking to feed the hundreds of participants including a BBQ chicken dinner Saturday night. Thanks to all the “Taste Buds” who did a wonderful job at the conclave. The section announced that the next conclave will be at Camp Garland in Shreveport, LA in 2017. Current Lodge Chief Thomas Ghiringhelli (left) and former Lodge Chief Jonathan Burt (right) representing East Texas Area Council at the Texas Report to State.